Yesterday was the State Opening of Parliament. According to the woman in charge of our study abroad in England (There is a “Lady” before her name. I honestly wasn’t sure if we were supposed to curtsy to her.) this is happening May and not November because of the recent election. Because the government class I took in high school was basically a joke (played on us), I don’t know much about the UK’s parliamentary government. But I have strung together little clues from movies like The Young Victoria and The Queen, and apparently the new prime minister (usually played by Michael Sheen) has to form a government in the queen’s name. Apparently they got it together faster than everyone expected which is why I saw the Queen yesterday. As the Head of State, only the Queen can open Parliament. Thankfully for the tourists, this is not a let’s-take-the-black-car-through-the-back-gate type of affair. It’s more of a shut-down-the-Mall-strike-up-the-band parade. We decided to play it safe and arrived at the Mall around 9:45 so we had a great view next to the barricades. We chatted with a woman who was on “holiday from the West Country” and had decided to play tourist like us. Behind us was a tall, older man who served in the Royal Air Force and was stationed in Canada and Africa during his career. 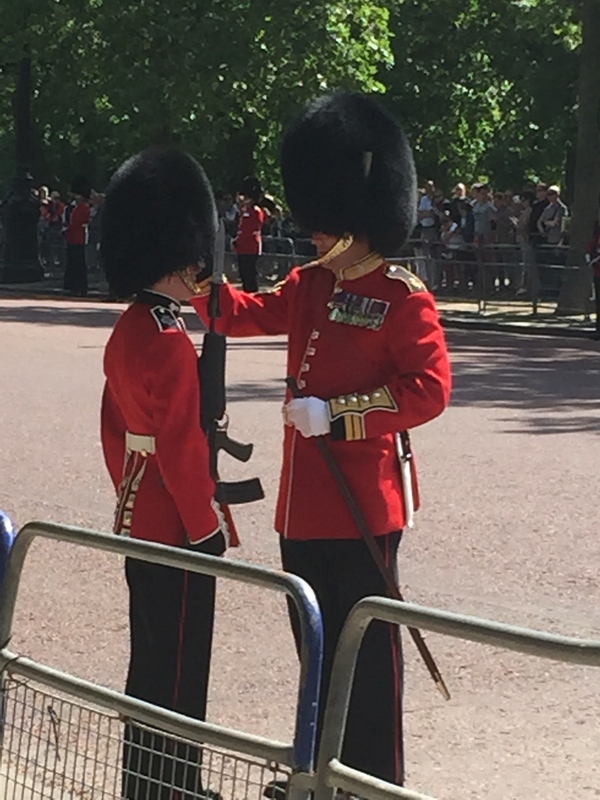 He told us little things about the military present as we waited: you can distinguish the different regiments by the spacing of the buttons on their red coats and only the Queen’s carriage is accompanied by white horses. And he was wearing a cravat so he was obviously a credible source. While we waited, the foot guards were moved into their places. They would march along the side of the road then turn and back into position. A few minutes later one of their commanders came by with a giant compass (like those kind you used in high school math) and would turn it as he walked to get the spacing between the guards exact. Later he came by again to the soldiers on our side of the Mall who were in the sun and would adjust their covers to cool them. Or at least that’s what I assume he was doing. Every few minutes someone would yell out an intelligible command that was telling them to wiggle their toes. I don’t know if that’s true or if Mr. Cravat was just pulling our legs. More waiting. We mercilessly held our ground as more people arrived and tweens in school uniforms tried to get closer. (Sorry, kids, but we flew 4,000 miles to be here. Your school is a few blocks away. We’re standing in front.) More regiments marched past eventually followed by a marching band. All of this gave us time to get our cameras ready. 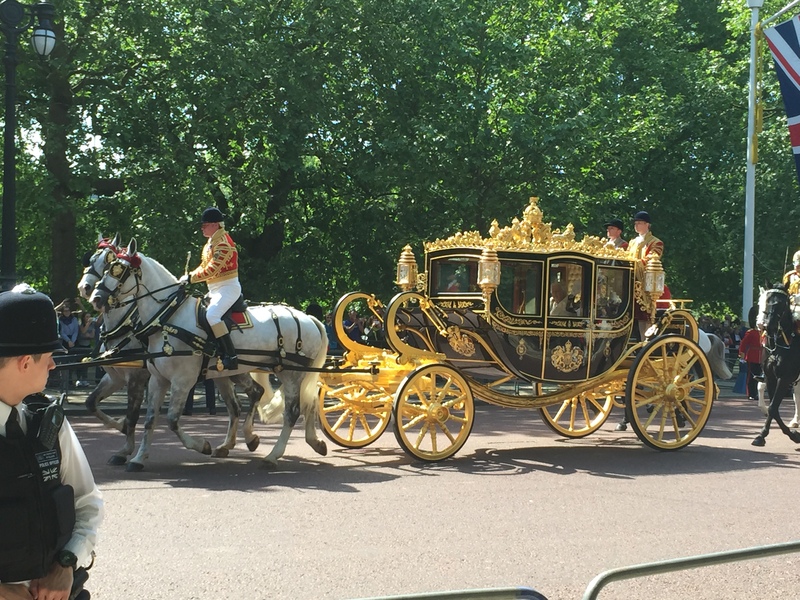 Suddenly a posh-looking car whizzed past going toward Buckingham Palace. We had just enough time to realize that Charles and Camilla were in the back seat. 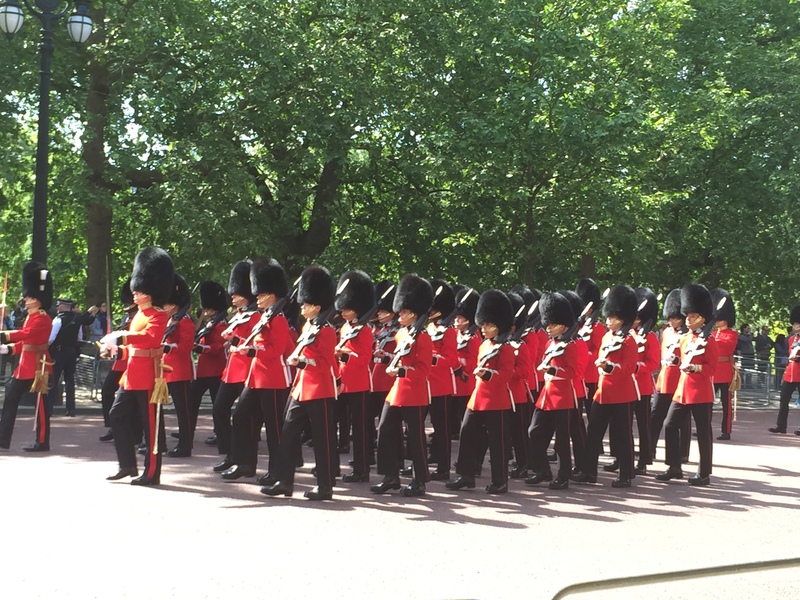 After about an hour, more regiments of The Queen’s Guards started marching past followed by the band. 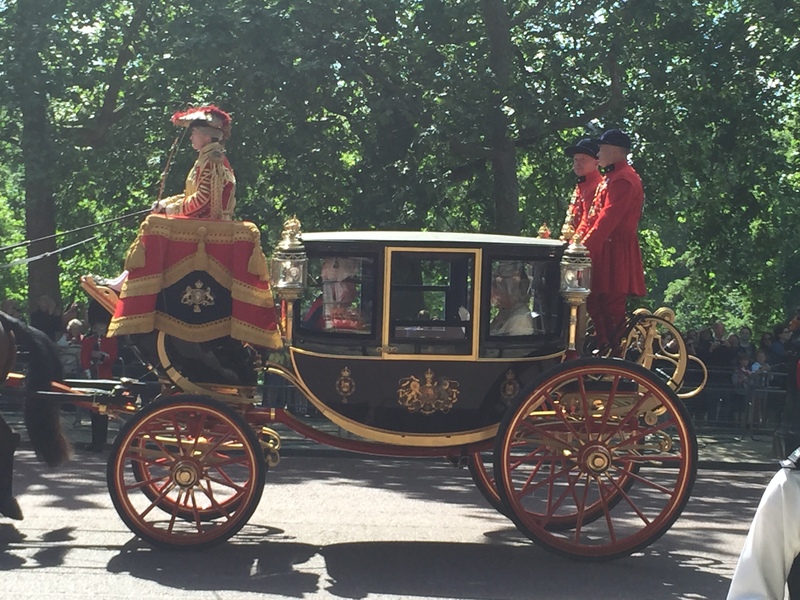 Then there were shouts of “royal salute!” and Charles and Camilla rode by again, this time in a carriage. Then “royal salute!” again, and there she was. Sitting next to Prince Phillip in the Jubilee Coach in a white dress, Queen Elizabeth II rode past us. She is probably one of the most photographed people in the world, but seeing her in person was something new entirely. Princess Anne and some other official-looking people rode after, and we started walking back to the Tube station. On the way, we past a crowd in St. James Parks and decided to see what they were looking at. About 100 yards away were six canons that fired 21 gun salute (I assume. I lost count of the number of times they fired, but 21 seems a likely number). Thank goodness we saw them. 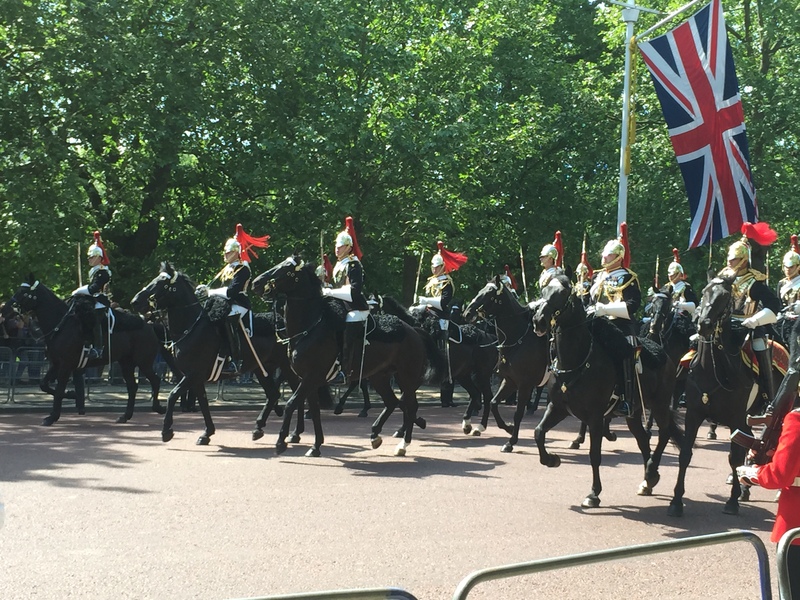 If we’d just been walking back and suddenly heard explosions, we would not have calmly thought “Oh, obviously just a 21 gun salute.” We walked back to the Tube and returned to the university for lunch. If you’d gone to the Tower of London that day, the Imperial State Crown would have been missing. Instead of a lavish proclamation that Elizabeth the Second, by the Grace of God, of the United Kingdom of Great Britain and Northern Ireland and of Her other Realms and Territories Queen, Head of the Commonwealth, Defender of the Faith was wearing the crown to open the Parliament of the United Kingdom, there is just a small sign that reads “In Use.” On September 9 which is only 103 days from now, the HM Elizabeth II will surpass Queen Victoria and become the longest reigning monarch in British history. In use, indeed. It was hot in the sun. I imagine even worse in that cover.